As I was listening to the president give his speech on the country's economy last week I was simultaneously trying to balance my checkbook. Math was never my strong suit. In fact, when it comes to math, I do not wear a suit at all. I would wear my birthday suit but it is too wrinkled and believe me, spandex is stretching it too much. Oddly enough, my checkbook balance is never the same as the balance on the statement from the bank. My bank's haughty assumption is that they are right and I am wrong. The thing that gripes me is, as much money as I am paying my bank through all of the miscellaneous fees, I should not have to balance my checkbook. That should be a service gladly rendered by my financial institution. The last time I was in my bank, I coyly suggested this to the teller and she looked at me, laughed as though I was telling her a joke and then handed me a lollipop. Believe me; balancing my checkbook is no joking matter. As I was working over my checkbook, I was groaning, moaning and sighing rather deeply. Enough so, that it disturbed my residential companion. Finally, she said to me in that sarcastic tone of voice reserved just for me, "What's got you so disturbed tonight?" At first, I did not want to tell her. After all, it is my responsibility to balance the checkbook. We have a wonderful give-and-take relationship. 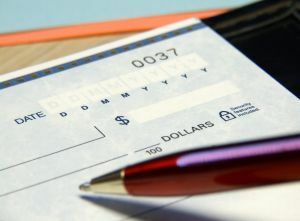 My responsibility is to deposit money into the checkbook while her responsibility is to make sure the checks fly out of our checkbook as quickly and smoothly as possible. Then, somebody at our financial institution came up with the brilliant idea of the check card. Now the money flies out faster than it ever did before. Our money flies faster than the speed of sound, but occasionally my groans do catch-up, and tonight was one such night. I looked at my wife, swallowed several times, and then blurted out, "I think we’re broke." After I said that, I did feel a little bit relieved. However, it did not last long. The way she emphasized the word "we’re" caused me a little bit of uneasiness. "I mean," I tried to explain; "we have run out of money." "Why should that get you all riled up," she said with a little bit of chipper in her voice. Just a little more than I was comfortable with under our present circumstances. "The president’s on television right now telling us that the country’s broke. So I guess that means were all in the same boat." Both of us were quiet as we listened to the president continue his speech on the economy. Actually, I was a wee bit more concerned about the economical condition of my checkbook then the country's economy. I'm broke simply because I have more bills than I have money. The country is broke because it spends money on things other than bills. And, when the government runs out of money all it has to do is to print more money. The thing that really aggravates me is that if I would treat my checkbook like the government treats its checkbook the government would have me arrested and thrown in jail for the rest of my life. Which, upon further thought, maybe a plan out of my desperate economic disposition. For in jail, the government would pay all my bills. In jail, I would not have a grocery bill. All of my medical needs would be taken care of by good ole Uncle Sam. I certainly would not have to save money for a rainy day. Further consideration brought me to the conclusion that I may not like some of the people in prison. After all, there may be former politicians who are locked up for some scandalous activity they were caught at. Who wants to spend their time with that crowd? Just as I was sinking deeper into the slough of despondency, my wife, as usual, came to my rescue. If I gave her a nickel for every bright idea she has come up with in our married life I would be broke. Which, by the way, maybe why I am broke now. Her amazing solution was simply this, "We’re not broke, we're just financially challenged." Why do I never come up with all of these brilliant ideas? Being broke is one thing but being financially challenged is something altogether different. I do not want to be broke. Now, thanks to my wife, I am no longer broke I am simply financially challenged. That sounds so much better. I worried my heart sick thinking I was broke when in reality I was merely financially challenged. I wonder if I could somehow get this message to our dear president. If I can get him a message I would simply say this, "Mr. President, our country is not broke as you are insinuating. We are simply financially challenged." Everybody has his or her own solution to problems. Especially if it is a political problem. I like how the Bible puts it. "There is a way which seemeth right unto a man, but the end thereof are the ways of death" (Proverbs 14:12 KJV). Someone said it like this, "a rose by any other name is still a rose."